The Horror Digest: Misery: I Bet James Caan Wished His Number One Fan Was Hotter. 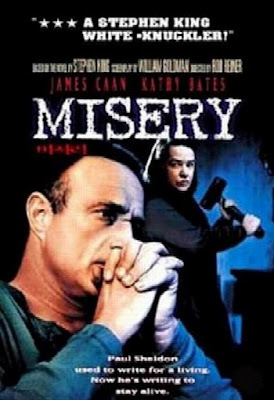 Misery: I Bet James Caan Wished His Number One Fan Was Hotter. OK honestly the obsessed lunatics just keep getting worse. Annie Wilkes may be the most terrifying obsessor yet. While not a lot of action takes place during the Misery, the movie still managed to keep me horrified and really anxious the entire time. Kathy Bates is truly terrifying and I don't know how James Caan's character held out so long. I would have done myself in as soon as she brought her pet pig in to meet me. I had never seen this whole movie before. When I was younger the only thing I could remember from it was when someone smashed a type writer on someones head. And honestly, knowing that that would happen at some point sort of kept me at ease in a way, because I knew retribution would come. 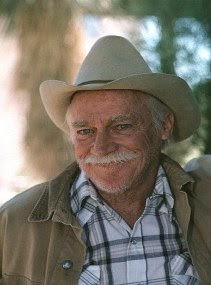 Paul Sheldon writes romance novels. He longs to write something deeper so he finishes the last of his novels, properly titled the Misery series for the main heroine, then gets to writing something new and different, deep in the mountains of Colorado. He drives straight into a blizzard and ends up crashing his car off a mountainside. Annie Wilkes rescues him from the car and being the beast that she is, throws him on her back and takes her back to her house. Here she takes care of his wounds and relentlessly tells him how much she adores his books. It is not too long before we realize that this woman has some problems. Paul notices it too, especially after her first insane outburst. I however could tell she was a whack job by the way she was whispering to him before he woke up that she was his number one fan and lah di da. So things just keep getting worse and worse. Annie forces him to burn his new manuscript, then forces him to keep the Misery series going. Finally when she totally loses it she of course performs the famous hobbling. And shoots a poor old man. And tries to convince him that they have to kill themselves together. Movies like this, where the hero is trapped somewhere and unable to escape really make me panic. That part when he explores the house for the first time made me so jumpy. I was going nuts. WHAT ARE YOU DOING STOP DICKING AROUND SHE IS COMING BACK WHAAT THE FUUCK for example is what my inner monologue sounded like. Then when his plan to drug her at dinner goes awry. EGADS I just wanted to scream. And finding the scrapbook....I knew she was messed up but a baby killer really? That's just nutty. Sigh. Here's the hobbling scene...try not to cry out in despair. I saw this movie several times before actually reading the book and I couldn’t believe it, but the hobbling scene in the movie is actually tame compared to what she does in the book. My God, it was horrible. Oh, and the scene in the book with the electric meat carver and his thumb - ugh. I can understand why that wasn’t in the movie. Wow! I'm definitely going to have to read that now....yikes.